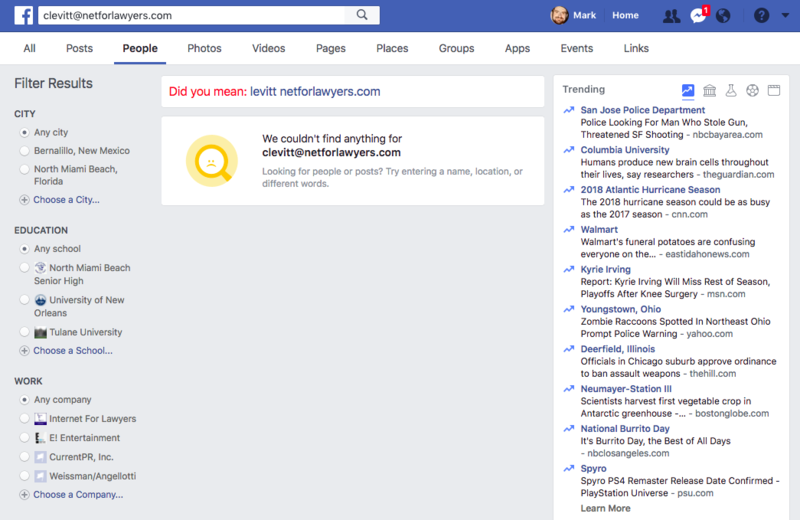 Facebook has discontinued many search features useful to legal professionals conducting background and investigative research of users on the popular social networking site. These include searching by email address and phone number to locate someone’s Facebook profile. The changes were spurred by recent revelations that political data mining firm Cambridge Analytica scraped publicly available information from an estimated 87 million Facebook profiles for political marketing purposes. (Reports estimate that 71 million of those profiles were of U.S. residents.) Recent reports indicate that the practice was also widespread among other third-party actors seeking to cull data (for various reasons) from the profiles of Facebook’s 2 billion users. 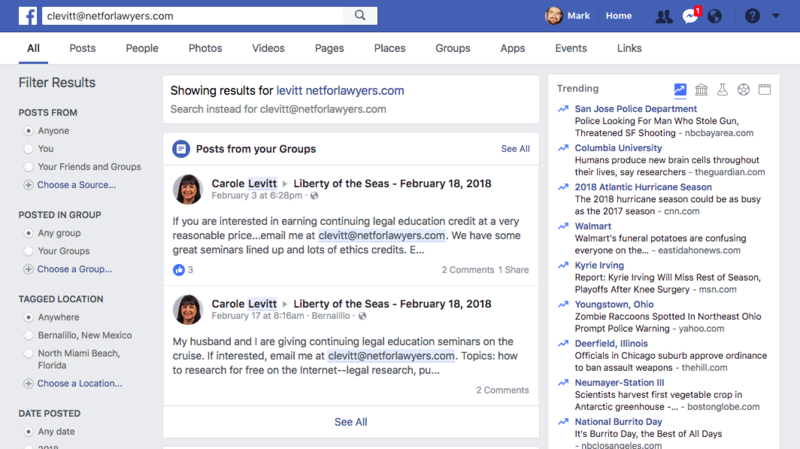 In our in-person CLE seminars and online webinars, we have long taught legal professionals how they could conduct these email and phone number searches themselves to locate background and investigative research information on subjects using the search box at the top of Facebook pages (when you are logged into your own account). These searches were particularly useful in locating Facebook profiles where users had adopted a pseudonym for their profile (or had a common name leading to too many results) but had used a known email address or phone number to open the Facebook account. As of now, those searches no longer retrieve results. Now, using the search box to search for the email address that an individual has associated with their Facebook account no longer retrieves any “People” results (see illustration below). Facebook will not even retrieve profile results for individuals you are “Friends” with on Facebook. Instead of searching through the member database for the email address you’ve entered, Facebook now treats these searches as full-text searches. The site (attempts to) locate the email address you’ve searched for as text in publicly available posts. In the example in the illustration (below), the email address search results seen are displayed only because Carole included her email address as part of the text of the posts that were returned. The same is true for phone number searches. In an announcement on its site, Facebook’s Chief Technology Officer Mike Schroepfer explained, how "malicious actors" had "abused these features to scrape public information" from Facebook profiles. "Given the scale and sophistication of the activity we've seen, we believe most people on Facebook could have had their public profile scraped in this way. So we have now disabled this feature. We're also making changes to account recovery to reduce the risk of scraping as well," he added in the post. These changes are designed to limit the amount and type of information third-parties can share into and retrieve from Facebook pages. Despite discontinuing these searches and methods of accessing profile information, the non-Facebook-affiliated search tool at SearchIsBack.com does still retrieve worthwhile relational search results (utilizing Facebook’s now also-discontinued Graph Search API). It’s unclear how long it will continue to function, however.